Characteristic and eye-catching features of the shocked cobbles from the quartzite conglomerates are the frequently strongly pock-marked surfaces from cobble collisions in contact, distinct craters as a probable shock spallation effect (see the page on Spallation), distinct closely spaced subparallel cracks without any shearing of the cobble, and in several cases an enormous squashing of the hard quartzite cobbles that nevertheless preserve coherence. 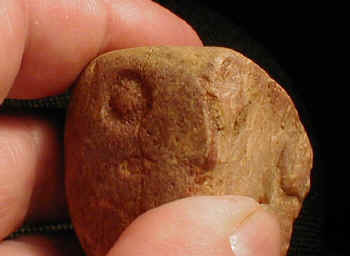 Regularly, several or all of the deformation marks are to be seen on one single cobble or boulder. To understand the manifold and complex features of the deformed cobbles we should remember the impact cratering process. In the very first moment a shock front or several shock fronts (from shock reflections, from the multiple Azuara/Rubielos de la Cérida impact) are traversing the Buntsandstein conglomerates leading to first fracturing with the formation of spallation craters and further spallation features to be shown in the Spallation chapter. Immediately behind the shock front the mass flow accelerates the pebbles, cobbles and boulders against one another producing the Hertzian fracturing and the pockmarks in general. 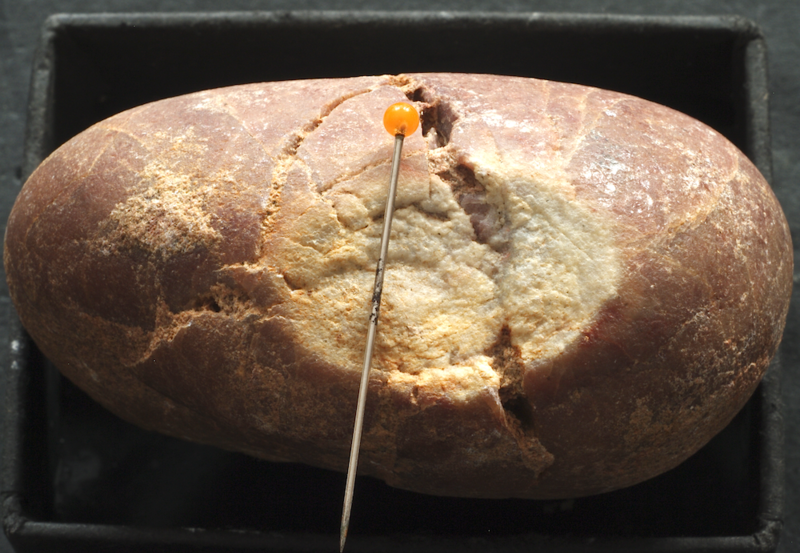 The rock mass flow under very high pressure with repeated onsets of shock fronts will continue some time leading to further deformation in the form of striations, polish and squashing of the quartzite cobbles and boulders. 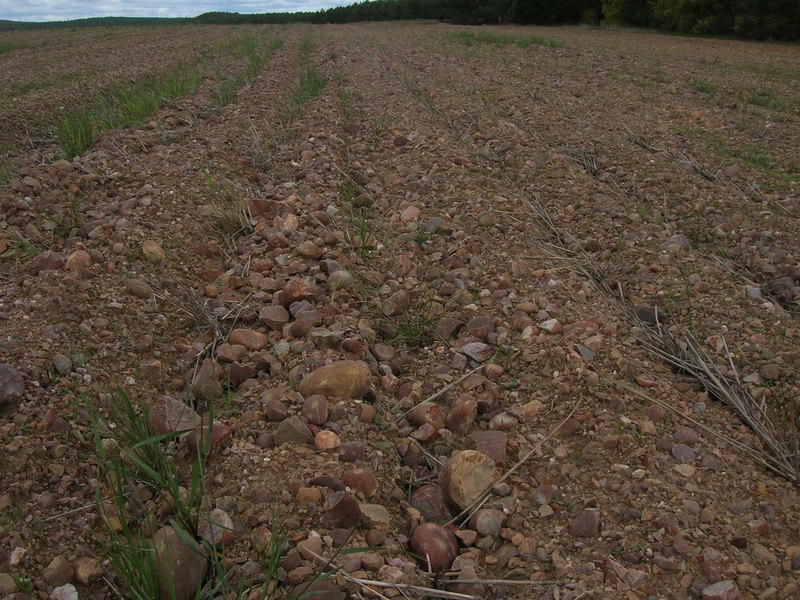 The strong relative movements within the conglomerates will in part have loosened the cobbles from the matrix especially in the case of sandy and clayey cementation followed by weathering to the large fields of completely disintegrated Buntsandstein conglomerates (see photo). These descriptions show full compatibility between field and laboratory observations and common knowledge of impact cratering. Observations, macroscopic and microscopic, are consigning pressure dissolution and tectonic deformation to the realms of geologic fantasy. We will not exclude that sometime a geologist will present a quartzite cobble from the area under discussion showing true pressure dissolution marks. This would not at all be surprising because the impact-induced pockmarks may be ideal nuclei for quartz dissolution during some post-impact tectonics. In fact, with regard to actual observations this would be the find of the needle in a haystack. Fig. 1. Sometimes cratered surfaces can be seen on limestone cobbles, and on cursory inspection they may be confused with the quartzite impact deformations under discussion. The origin is well known and easily explained. The cratering begins to form when a limestone gravel layer is cemented by carbonate precipitation filling the spaces between the cobbles, and a conglomerate forms. At the contacts of the cobbles there is no carbonate precipitation, and holes are left blank. 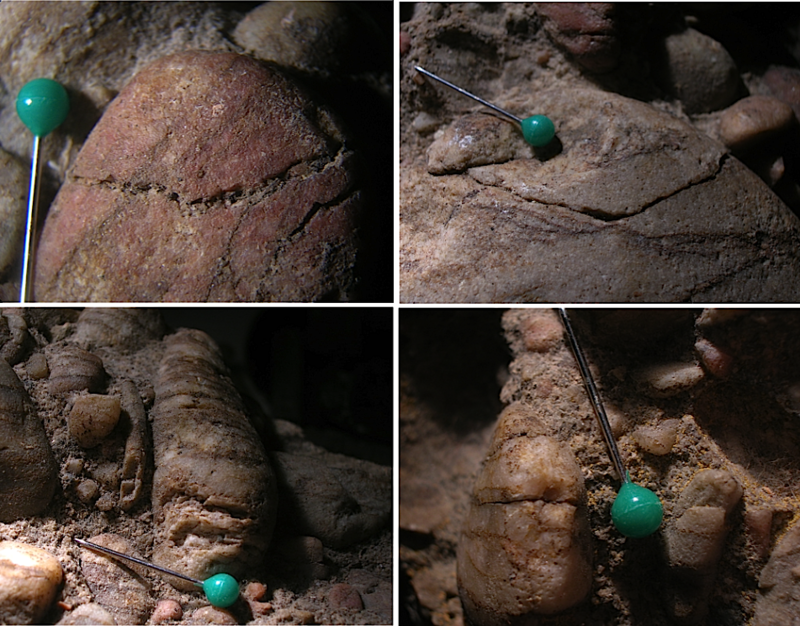 The holes may deepen by – here indeed – pressure dissolution, and at the original cobble contact in the center of the depressions the material remains undissolved. – Sampled as so-called Isar cobble near Munich. Fig. 2. Quartzite cobbles showing typically pock-marked surfaces. 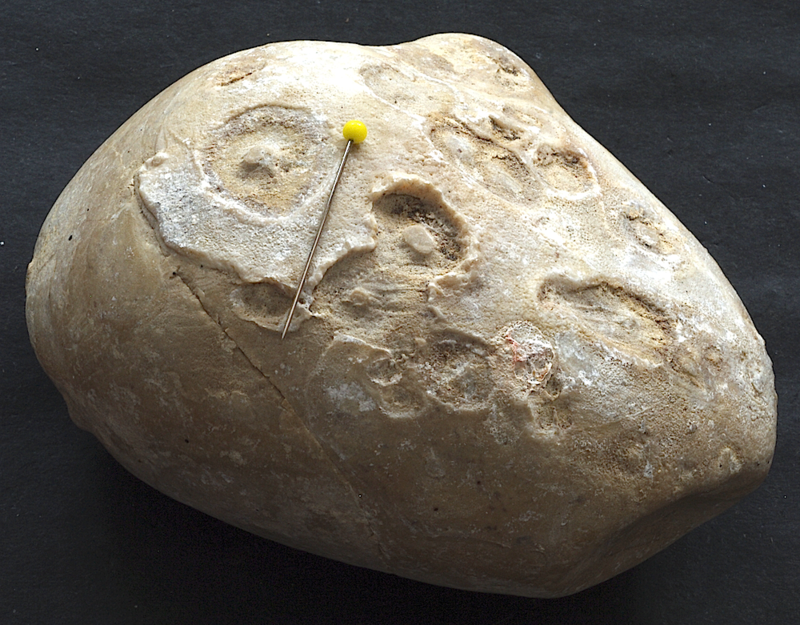 The pockmarks are mostly flat, circular to elongate depressions grazed by countermovements of cobbles in contact. The whitish colour results from micro-fracturing in the contact zone (click the page: Looking into the cobbles). A simple look into the microscope had brought this fact home to the impact deniers that pressure dissolution is sheer impossible. Fig. 3. 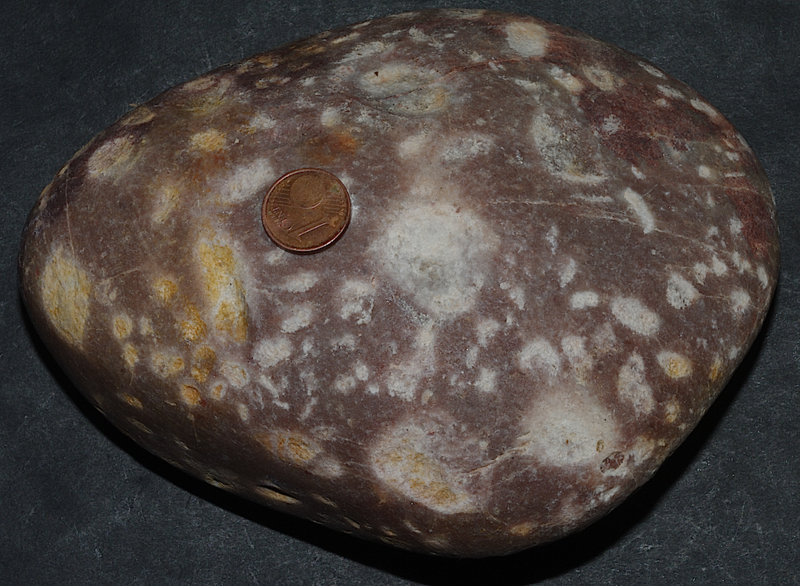 Quartzite cobble showing a strongly pock-marked surface. Like with the cobbles in Fig.1 the pockmarks are flat, circular to elongate depressions grazed by countermovements of cobbles in contact. The distinct sub-parallel fracturing will be discussed below. Fig. 4. 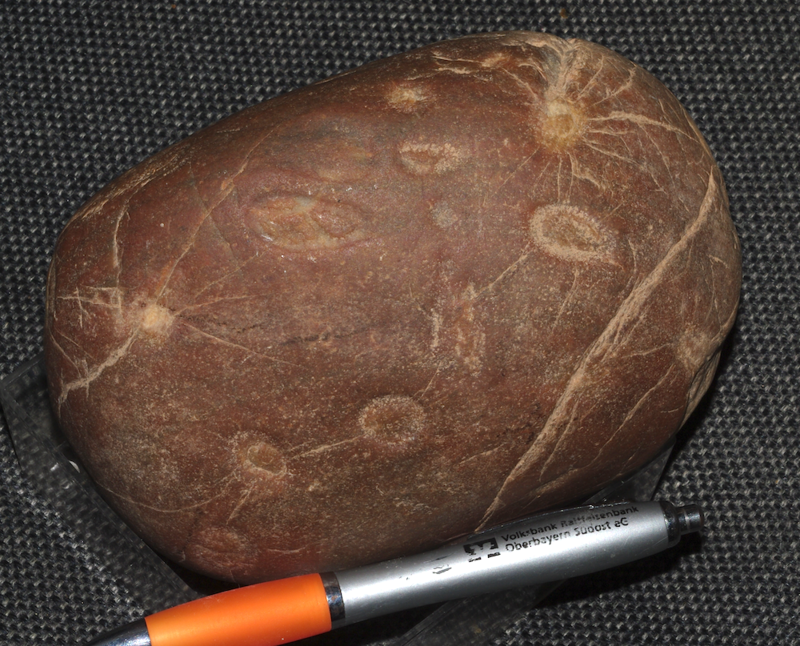 A quartzite boulder heavily pock-marked all around. Two types of cratering on the surfaces of the quartzite cobbles have to be distinguished: craters exhibiting a central mound, and true bowl-shaped craters. The physical processes of formation are likewise different although both my have interfered. 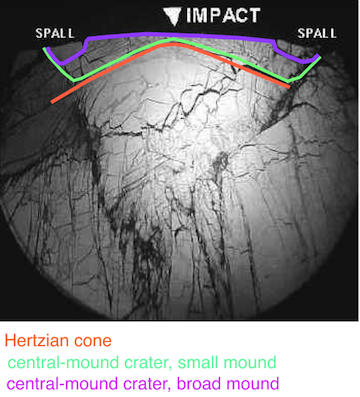 The central-mound craters frequently combined with radial and concentric cracks are suggested to result from well-known Hertzian indentation or concussion fracturing (Fig. 6 A, 7B). Fig. 6 A. Hertzian fracture cone: precursor of the central-mound craters on the surfaces of the quartzite cobbles and boulders. See the experimental cratering in Fig 7B. The deeper bowl-shaped craters are suggested to have resulted from shock spallation (see the page on Spallation). The main physical difference is that Hertzian fracturing needs a colliding partner (well given in the Buntsandstein conglomerates) while shock spallation cratering may happen independent of a contact with another cobble. Fig. 6 B. 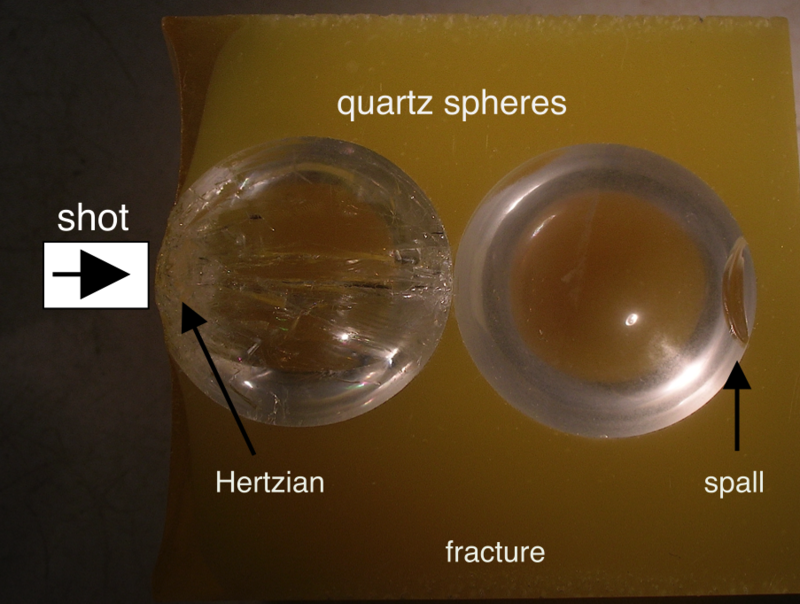 Experimental production of Hertzian and spall craters in colliding quartz spheres (14 mm diameter). More about these experiments on the page “Impact experiments on synthetic conglomerates”. Fig. 7. 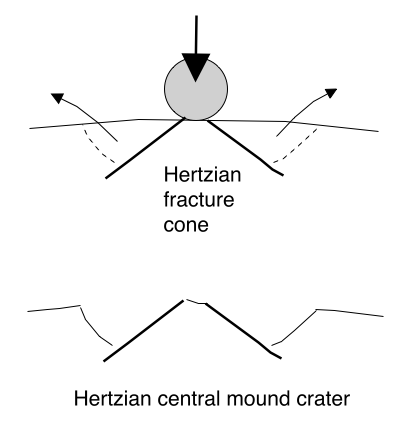 Formation of central-mound craters as a result of Hertzian cone fracturing. 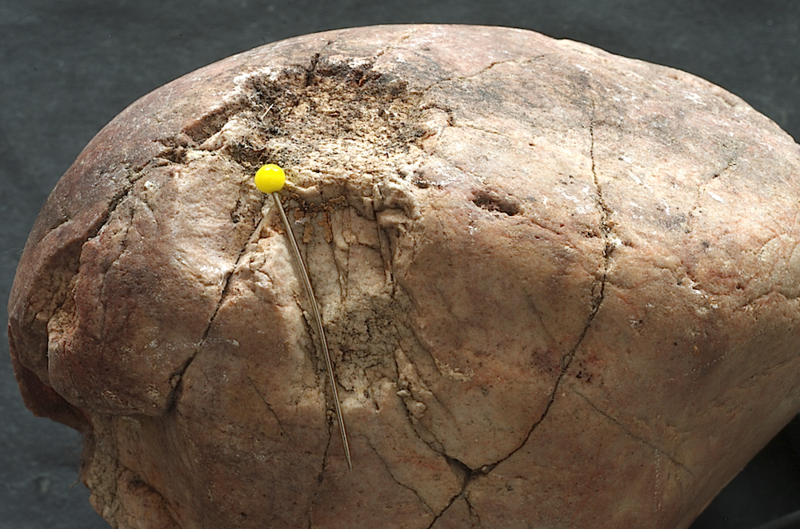 The blue line delineates the mound being preserved at the point of the projectile impact (see Fig. 6 A). Fig. 7 B. Another experimental impact (shot 2) on a quartz sphere showing fracture patterns that enable central-mound cratering with different crater shapes which depend on the special stress-strain conditions. More about the experimental impacts in the respective chapter. Fig. 8. 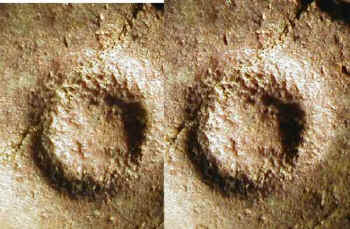 Formation of bowl-shaped craters as a result of spallation. For geometrical reasons the tensile fracture from shock reflection mirrors the spherical surface to produce a lens-shaped spall. 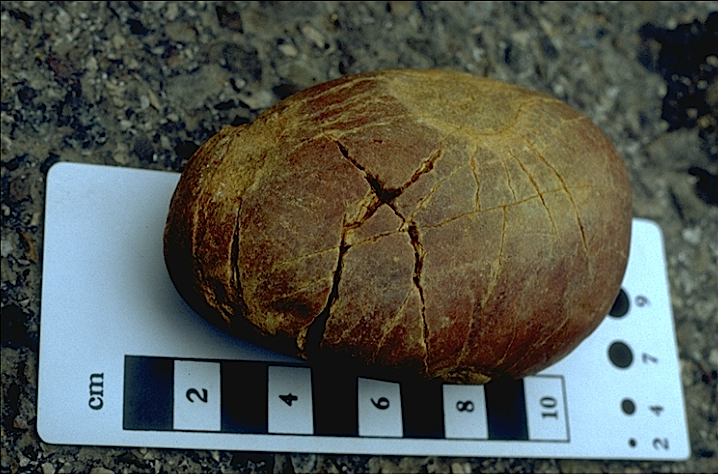 This experimental spallation fracture has a natural equivalent in the quartzite cobble from Fig. 9. We see a typical widely open spallation tensile fracture to be a mirror of the shock-reflecting surface as the beginning of a full crater formation. Fig. 9. Classic open tensile fracture from shock spallation as a mirror of the free surface. On full development of such a lenticular spall true bowl-shaped craters on the surface of a shocked cobble occur. Fig. 10. 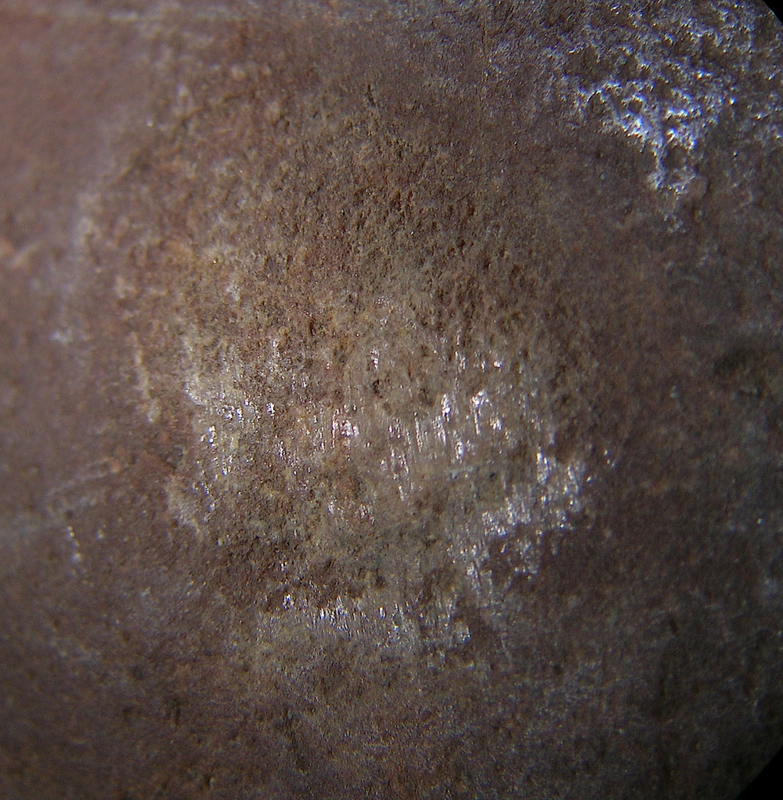 Cratered surface of a quartzite cobble. Note the strong radial fracturing and the central mounds in the miniature craters. Fig. 11. Single crater with a distinct central mound.The existence of the central mound can be explained by the heavy collision with a contacting cobble. The pressure distribution leading to this shape was already established in the 19th century by the famous physician Heinrich Hertz. Also see Figs. 6 A, B, Fig. 7. Fig. 12. Stereo photograph of the crater in the image above. The stereo effect can be achieved with stereo glasses or simply with practiced eyes. Fig. 13. A distinct 4-cm diameter crater with a central mound. Note the sharp contours of the crater. Fig. 14. One more large depression with concentric zoning partly associated with cracks as is expected for Hertzian fracturing. 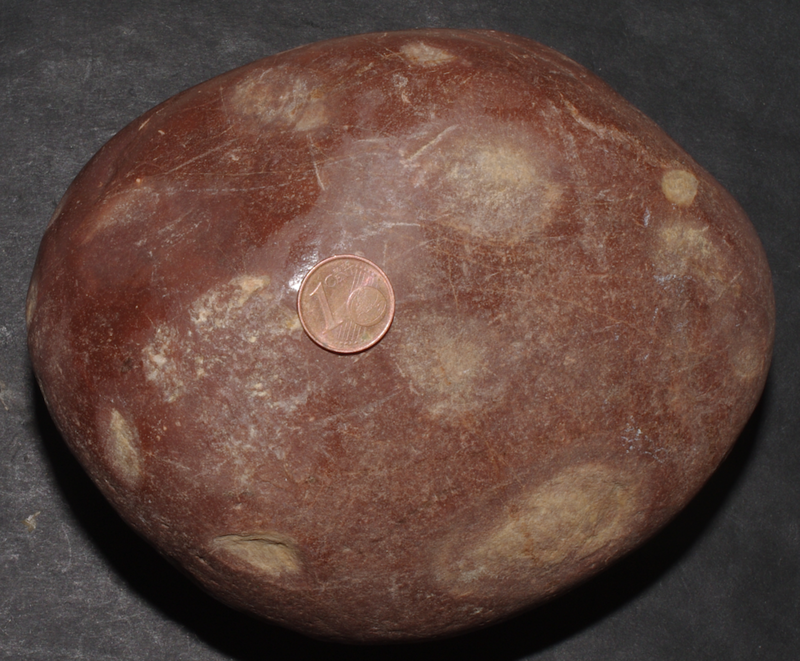 Note the polish in the upper part not infringing on the granular interior of the cratered area. More often, however, the polish is also seen within the depressions proving that the cratering preceded the polish (see Figs. 29, 30, below). Fig. 15. A flat Hertzian crater with a broad central mound and distinct radial and some circumferential cracks. Fig. 16. A Hertzian crater with preserved central part where the cobbles collided, and distinct diametral cracks. Fig. 17. 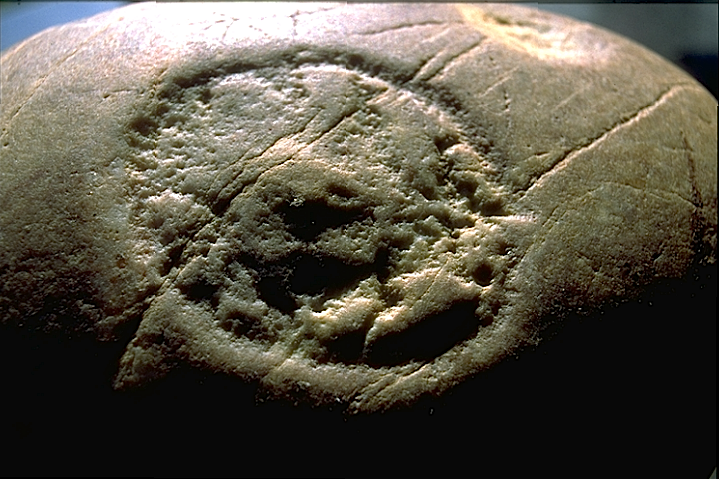 A Hertzian crater with radial and concentric cracks exhibiting conical fracturing downwards – as expected. Fig. 17A. 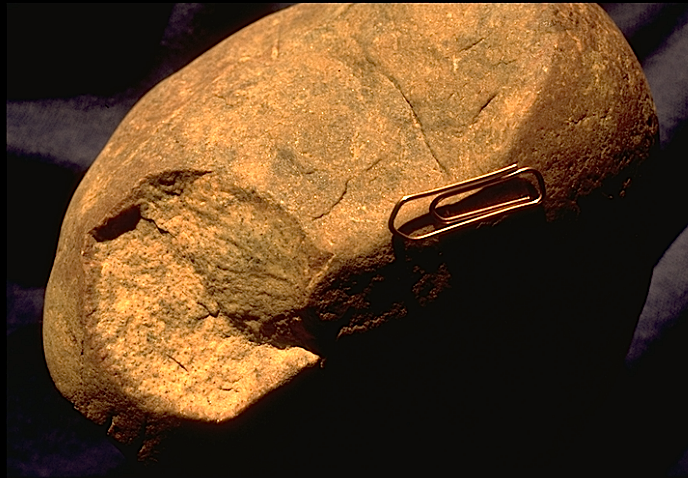 Collision point at the paperclip and exposed part of the Hertzian fracture cone with “horsetail” fracture markings reminding of a shatter cone. Fig. 18. Probably a bowl-shaped spallation crater. Coin diameter 15 mm. 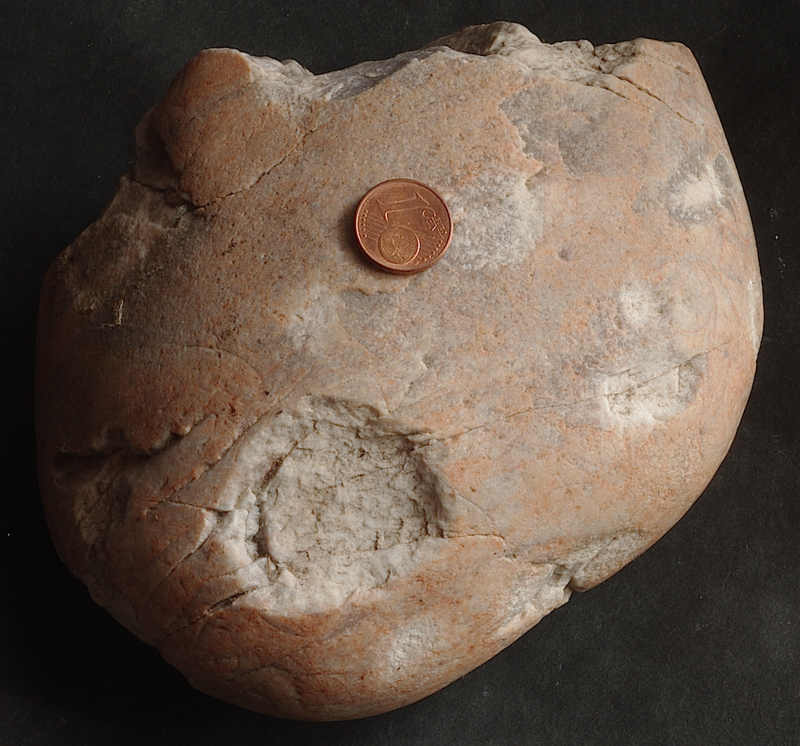 The crater is about 5 mm deep – or flat corresponding to the flat convex surface of the quartzite boulder. Fig. 19. A storybook quartzite cobble with two opposite spallation craters. Again note the sharp contours indicating brittle fracturing. For the origin of the craters from spallation see here. Fig. 20. Quartzite cobble showing two collision contacts with strong radial fracturing. Note the crossing widely open tensile fractures without any shearing of the cobble. 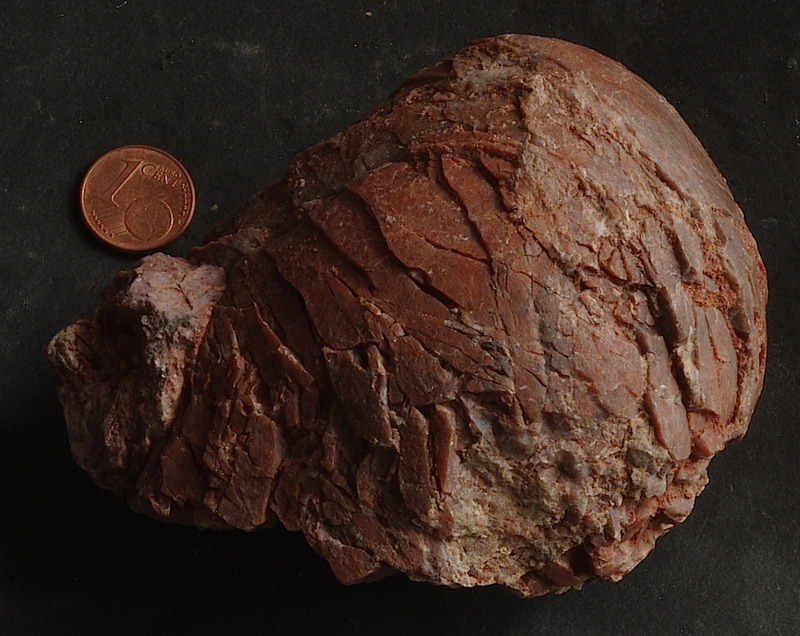 This proves short-time deformation and excludes tectonic compression, which would have sheared the component within the conglomerate. Instead these open fissures can reasonably be explained by dynamically acting spallation only that stretched the cobble. Fig. 21. 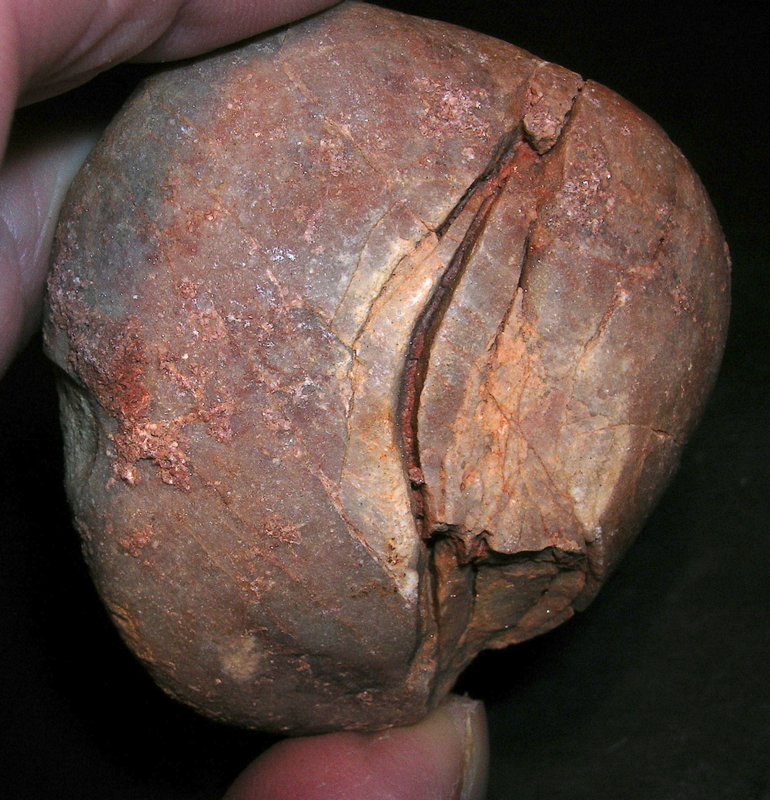 The strongly squashed quartzite cobble, however not broken to pieces, is incompatible with long-lasting tectonic stress in the conglomerate, but indicates short-time deformation under high confining pressure. Fig. 22. More strongly squashed quartzite cobble, however again not broken to pieces. 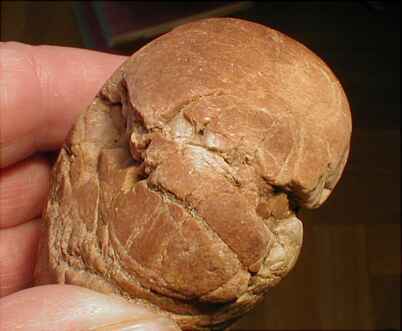 Long-lasting tectonic stress in the conglomerate as the cause can basically be excluded, but the squashing indicates short-time deformation under high confining pressure. Fig. 23. 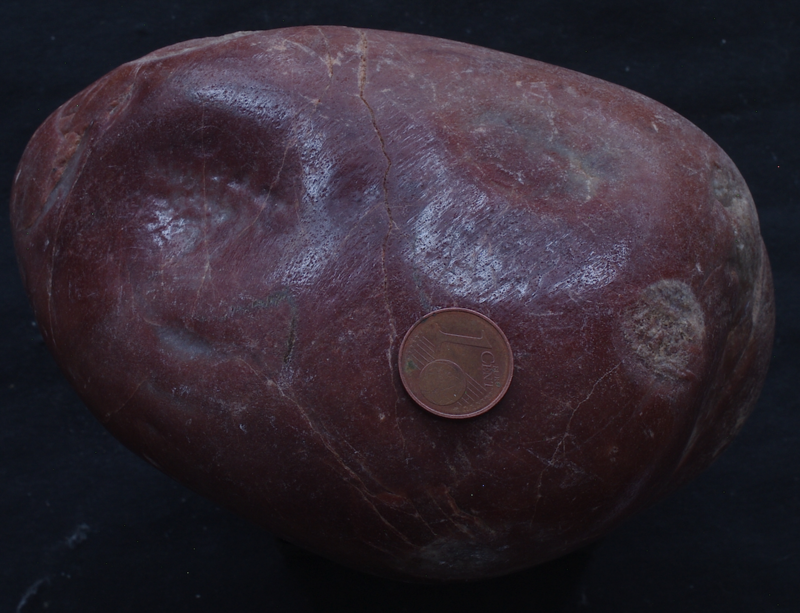 Even more impressive the heavily deformed quartzite cobble with dissection into distinct chips that in part have significantly been rotated – without breaking the cobble to pieces! Fig. 24. 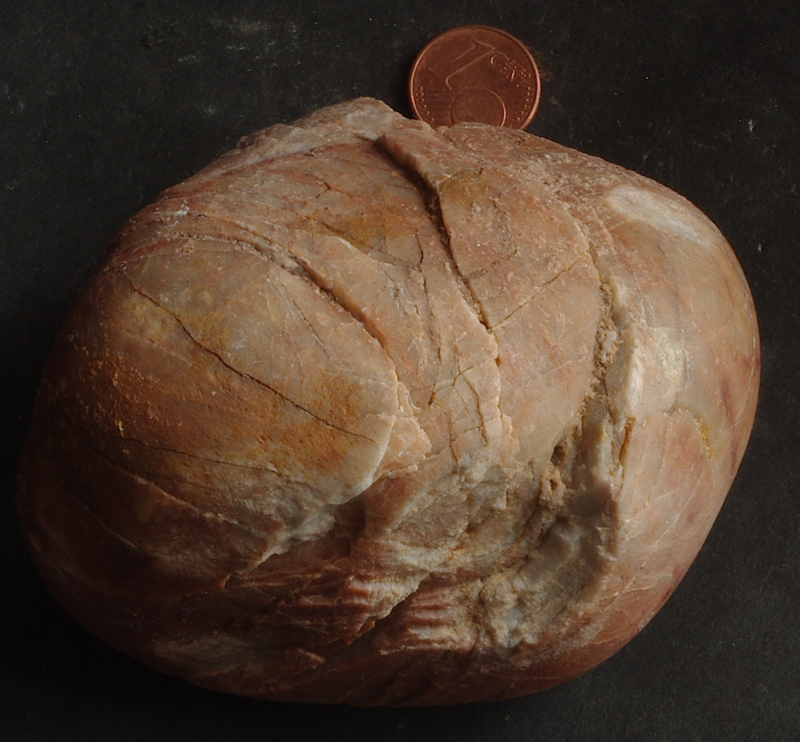 Heavily dissected quartzite cobble that however remained coherent. Comparable features are typical for impact-induced high-pressure/short-term deformations. They abundantly occur within the ejecta of the Azuara impact strcuture (Pelarda formation ejecta) and of the Rubielos de la Cérida impact basin (Puerto Mínguez ejecta) as well as in the ejecta of the Ries crater impact structure (see HERE). Quite a few of the cobbles show a distinct polish that particularly under the microscope proves to be an ultra-fine striation, in many cases all around. Fig. 25. A quartzite cobble heavily polished all around. 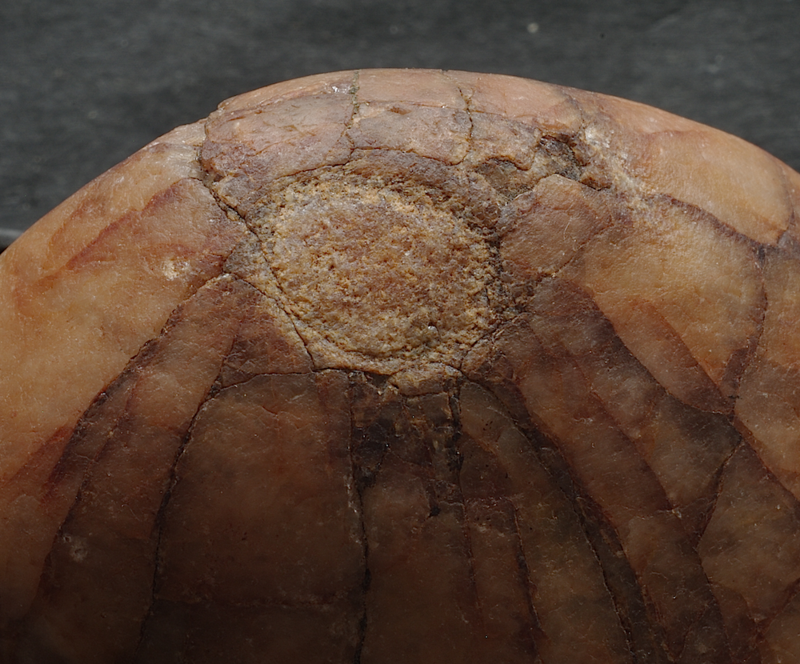 Here, the striation can be seen with the naked eye, otherwise evident only under the microscope. Fig. 26. Distinct polish resulting from ultra-fine striation of the quartzite surface. Width of field is about 5 mm. Fig. 27. 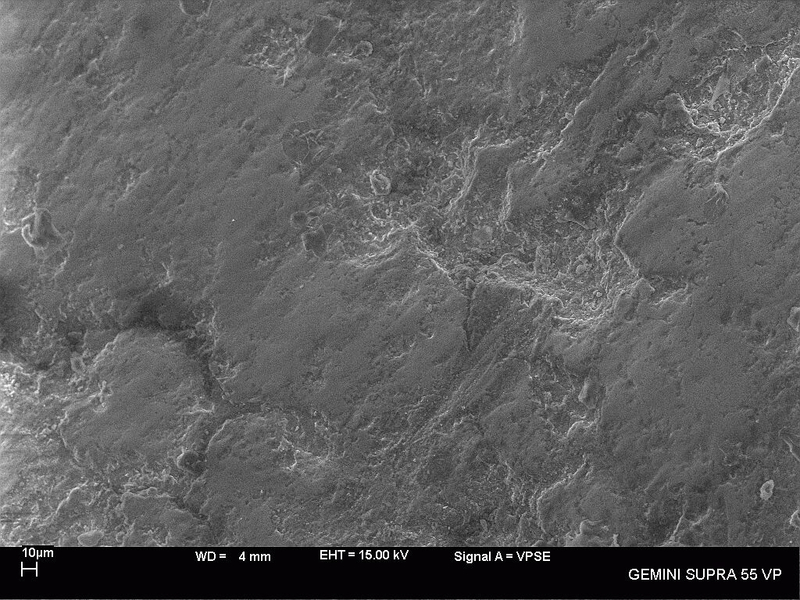 SEM images of the polished surface of a quartzite cobble. Fig. 28. 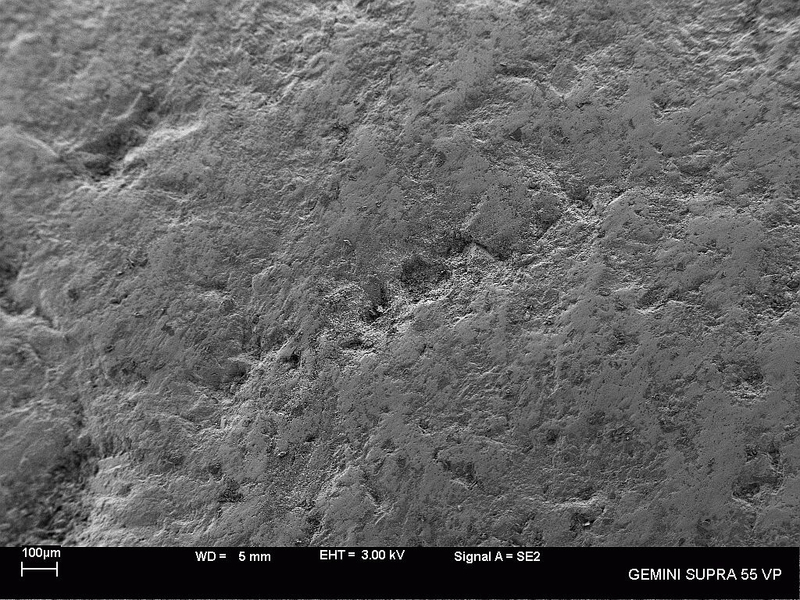 Stronger magnification: SEM image of the polished surface of a quartzite cobble. 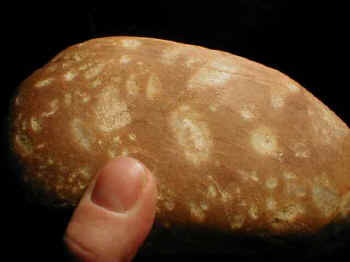 The polish/striation must have originated from an extreme confining pressure when the cobble was accelerated in a clayey-silty matrix of the conglomerate. This can best be explained in an impact shock event. Fig. 29. 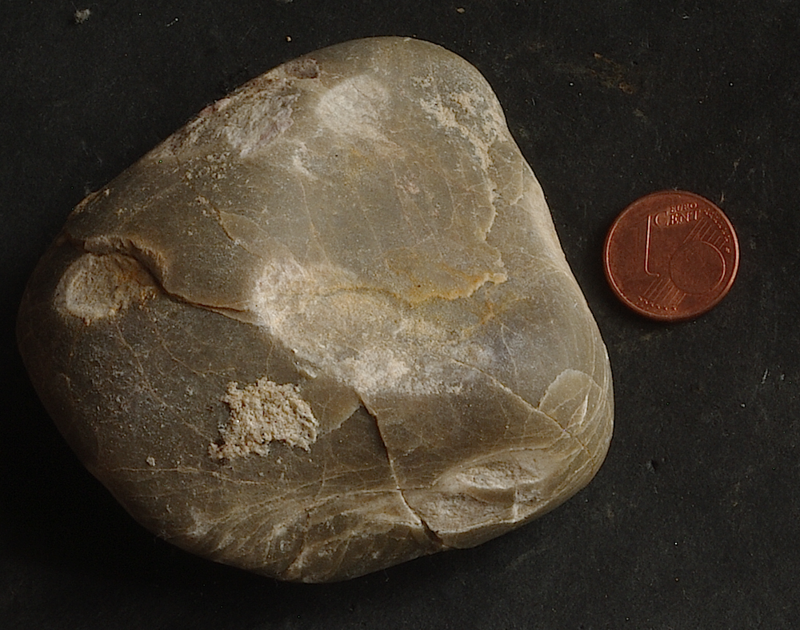 A pock-marked, cratered and faintly polished quartzite cobble. 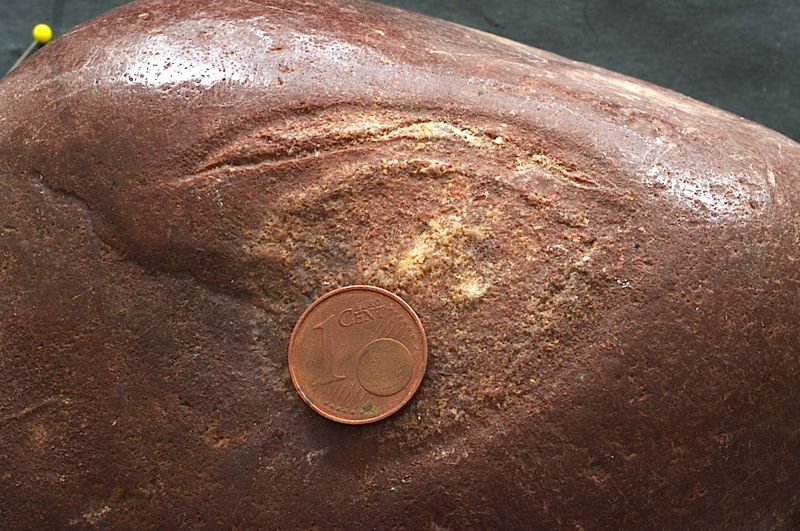 Here it is important to note that the interior of the depression near right to the coin also shows striation and polish as seen in Fig. 30. Fig. 30. 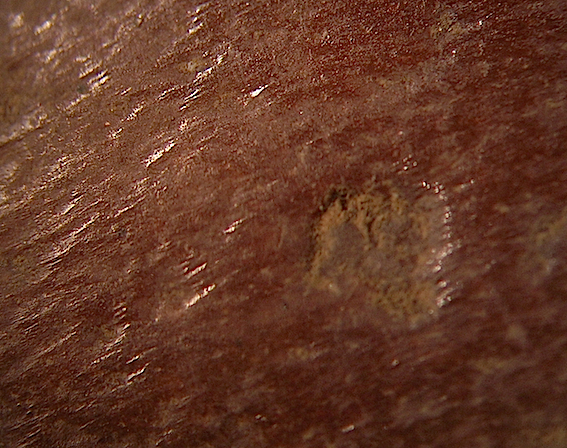 Close-up of the surface in Fig. 29 exhibiting striation and polish within a collision depression. 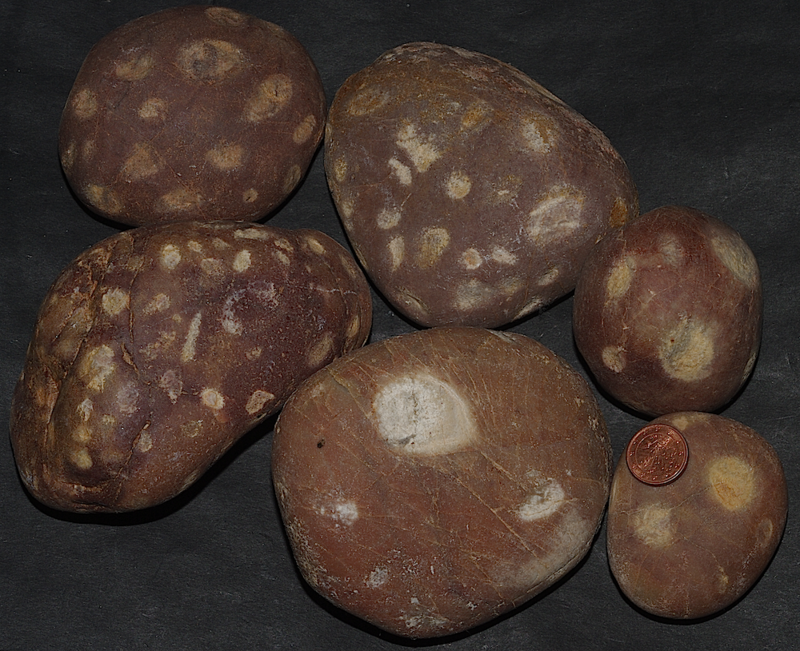 Hence, collision of cobbles/boulders preceded the high-pressure striation and polish. Only recently an analysis of the cobbles’ polished surface has revealed a so far inexplicable hardening with Mohs hardness of 8 on polished areas compared to 7 or less on normal unpolished quartzite. A short report may be clicked HERE. 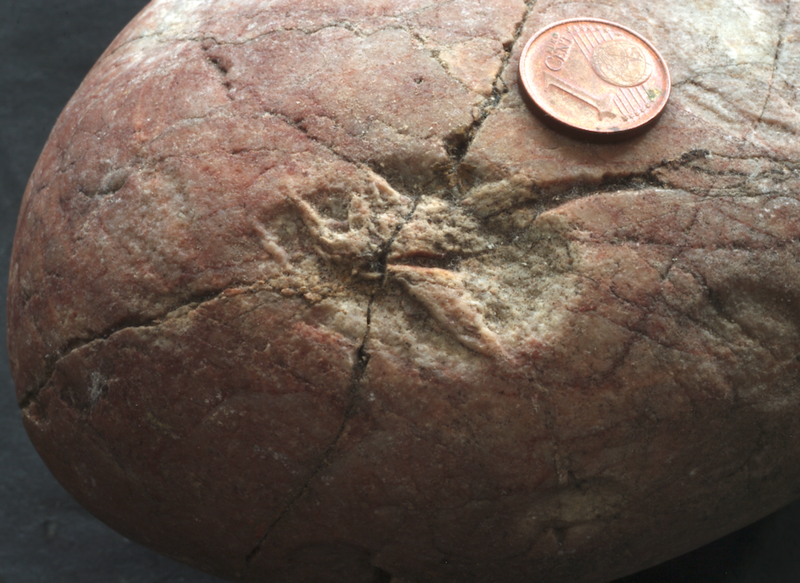 A subparallel fracturing is in general best developed in still existing conglomerate parts where the quartzite pebbles, cobbles and boulders are embedded in a sandy matrix (Fig. 31). More about the subparallel fracturing is addressed in a special chapter. Here we show a typical aspect of the surfaces where also the typical spallation open tensile fractures can be observed (Fig. 32). Fig. 31. A preserved block of impact-affected Buntsandstein conglomerate exhibiting a distinct subparallel fracturing. Not any shearing of the clasts can be observed. Several pebbles and cobbles show typical open curved spallation fractures as a mirror of the surface (Fig. 32). Fig. 32. 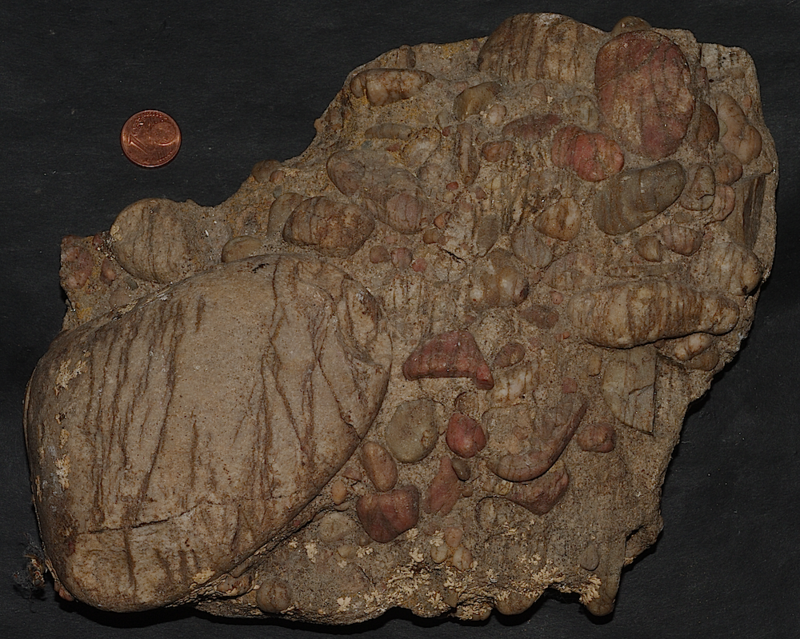 Clasts from the conglomeratic block in Fig. 31 showing open spallation fissures. It is worth discussing whether most of the subparallel fractures have originated from spallation (see the respective chapter).